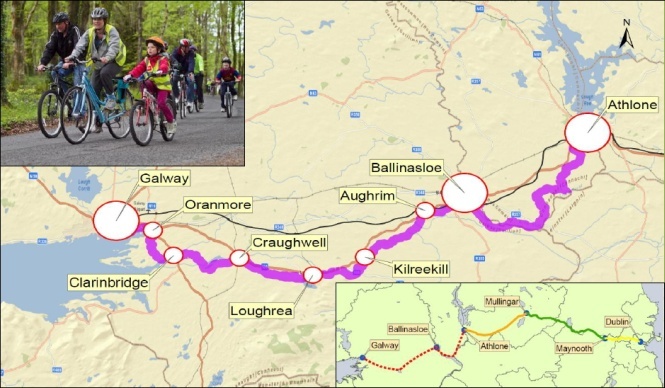 Consideration must be given all options to secure land for the greenway on the National Cycle Route between Dublin and Galway, a junior minister has said. Ann Phelan TD (Labour), who is a minister for state at the departments agriculture and transport with special responsibility for rural economic development and rural transport, said that consideration must be given to land purchase by agreement, “or, if necessary, by CPO”. She said that people only have to look at the success of the Great Western Greenway (shown in photos above and below) in County Mayo to see how facilities such as these can revitalise our rural areas by bringing new visitors from both home and abroad to areas of the countryside and towns along greenways. “The process of obtaining permissive access is resource intensive and I would have my doubts that such a process could be deployed on projects of national scale such as the Dublin to Galway greenway where agreement would need to be secured with hundreds or more landowners,” she added. While the Great Western Greenway is overall a success story, the “permissive access” system used for the route has long had issues. 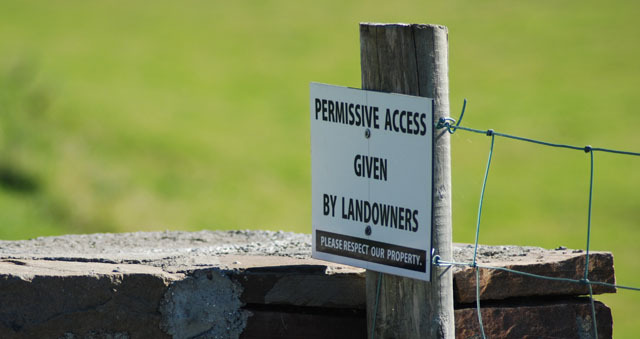 Landowners retain full ownership of the land, but allow public use. Council officials say privately that while it was cheaper to get off the ground, maintaining all the agreements is too time consuming and problematic. From time to time, sections of the Mayo greenway have been closed off forcing families and others out onto narrow and busy main roads. Usually the closures are unrelated to the greenway — in one case a part-time farmer closed a section of the greenway because he had a non-farming dispute with the council relating to another part of the country. The latest threat of closure made the front page of the Castlebar-based Connaught Telegraph newspaper last week (pictured, right, but not online), with the headline “We’ll block the greenway” — a threat related to farming payments with national government. The Connacht Tribune reported recently that the Galway IFA Chairman stated that there would be “absolutely no cooperation” from farmers for this project until the word CPO (compulsory purchase order) was taken off the agenda. “[CPOs have] involved ESB lines, gas pipeways and new roads but to destroy a commercial farm for a walkway is just something that farmers will not accept. This is not critical infrastructure and there are alternatives available,” said Pat Murphy, Galway IFA Chairman. “There is no point in building greenways if not enough people use them. We must route greenways to ensure they provide connections to sites that attract tourists, have reasonable gradients for all users, connections to towns and villages with public transport, and a good experience with nice views for users along the route. That is the logic that has been followed by the National Roads Authority and Westmeath County Council, which is leading the project, in identifying the preferred route options from Athlone to Galway. These preferred routes were the subject of public consultation recently in County Galway. I understand that useful discussions were had at the public meetings and this will be reflected upon in the coming months,” she said. She said that it was her understanding that the second round of public consultation will be held early in 2015 when the preferred route will be displayed for information and further public comment. Following the second public consultation, the comments received will be used to evaluate and refine the preferred route. A detailed design of the greenway will then be progressed, which will define the extent of the lands required. An environmental impact statement and compulsory purchase orders, if required, will be prepared and subject to funding will be submitted to An Bord Pleanála for approval by the end of 2015. Well said Minister – couldn’t have put it better myself. Permissive access is not a long-term sustainable solution.